Before I was taught that I was weird. I had a happy childhood. I grew up in the newly developed suburb of Bollmora, south of Stockholm, Sweden. Our flat was big and modern, the surroundings mainly forested and there were playgrounds and paved bicycle paths everywhere. 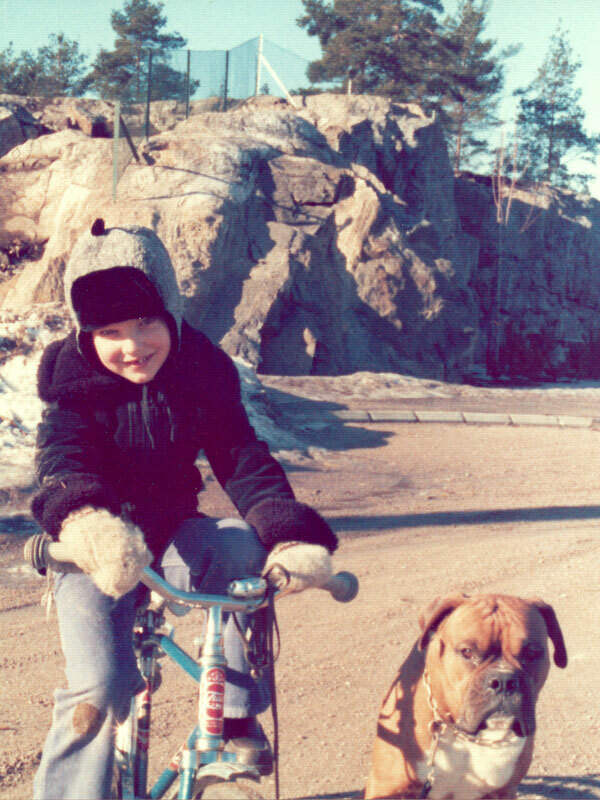 We had a dog called Zondor, a very kind but rather stubborn boxer. It was the early 1970s and things were good. When I was six I started pre-school, and the year after that first class at the school proper. Over the next four and a half years, I made a few friends, an enemy or two and had a couple of crushes on girls in my class. Pretty typical stuff, all told. I wasn’t bullied. I was a bit shy, but somehow rather cocky, and I actually ended up in a fight over something silly that I’ve forgotten now. I lost the fight. 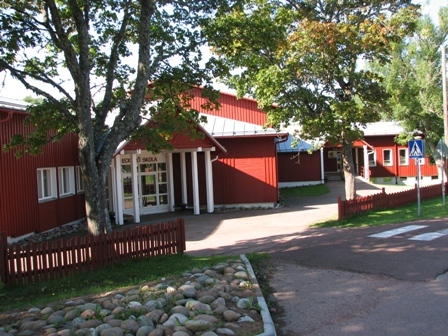 Then, when I was 11, we moved to the countryside in Åland, Finland. Things were suddenly very different. I was different, what with my big city accent and slightly cocky attitude. Within five minutes I had been targeted by the class bullies. I don’t remember the school looking this idyllic. Or red, for that matter. The following four and a half years were not happy years. I quickly learned to feel fear, to try to stay invisible and to live with that icy panic in my stomach every time I was going to school. I wasn’t subjected to particularly heavy bullying (it was mostly verbal abuse, assisted by some punching and shoving into walls or pushing into ditches), but it was a constant thing. It was relentless. I went from being a self-assured happy boy to an intimidated and scared one. As I tried to keep my head down and myself out of trouble, I could feel my self-esteem dissolving and disappearing. Anything I showed an interest in was immediately ridiculed. I was left with no doubt that I was different and weird. If I was particularly good in a subject at school, I was targeted for being a teacher’s pet. If I was bad at something I was told I was worthless. Yes. Worthless. More than anything, I was taught to feel worthless. Things changed for the better once I was out of primary school. Most of my bullies went for practical educations, whilst I went to Ålands Lyceum, the local sixth form college or high school. I wasn’t bullied anymore, but I was still shell-shocked and withdrawn. I had learned that people could be mean and sadistic, and it would take years before I would recover from that. The thing is that I was still the same self-assured person somewhere deep inside. There was a conflict inside me, a fight between my two personalities. I had been taught to feel worthless, but I didn’t actually believe that I was worthless. I’d learned to modify my behaviour, and to not trust other people, but I still knew somehow that I was worth something. This made it easier to rebuild my confidence, but the scars from having been bullied wouldn’t go away completely. I rather enjoyed teaching. It was very rewarding and a real ego boost. So today, my original personality usually wins out. Most of the time. I still have relapses. I still sometimes feel like an outsider; like I don’t fit in. I can still get that icy panic, even though it’s less frequent and less intense than it used to be. The difference is that I now know that it doesn’t matter. It doesn’t change who I really am. It doesn’t define me. I’m still me and I know my worth. I might be different and weird, but I’m proud to be weird. I’m proud to be me. And that’s something no one can ever take away. My son went through a period of bullying. Two years worth. But he was somehow able to keep his sweet wonderful self intact until he went to a bigger school. The bullies from all the other schools squared off with each other and he was able to skate past them. Yes, I think if we have a good enough sense of self-worth, we can somehow remain true to ourselves even after having been bullied. Yet another reason to make sure our children know that they are loved. You show me where these people are who bullied you and I will fight them! **I will totally lose, but I will fight them. Aw, aren’t you nice! I’m touched, I really am! But you don’t have to fight them; if I understand correctly how things like this works, their lives are already punishing them as we speak. Okay, fine. You are probably right. Does this mean I have to take the dog poo off their porch? Yes, when you stamp out the different and weird, you are left with a life that is endlessly the same — ie. one not worth living. Yes, yes, I’m beyond all that too (not). I went through some stuff too that I try to block out mostly. My friend asked if I was worried that ignoring stuff will make issues pop up later. I told her when that happens, I usually try to think about how weird Stephen King is. Have you tried thinking about how weird Stephen King is? Stephen King is weird. And one should never underestimate the power of denial and suppression. I “favoriting” this comment. There is no button, but I’m doing it anyway. FAVORITED. There, all done. I know, there’s no ‘Like’ button either. It’s like WordPress is anti-social or something. Sometimes I think the chemicals in my brain got messed up. Something about learning to produce oxytocin by bonding when you are younger. If I could just produce more oxytocin, I’d be like a regular person. I would even watch Dancing with the Stars. And maybe the sports. Please don’t be like a regular person. We need weird people to keep all the normal people at bay. And sports. Wait… This is supposed to be about YOU, not me! Where are those people who bullied you again? I’ve decided that rather than fight them, I will leave dog poo on their porch. Well, that I can condone. Some people definitely deserve some dog poo on their porch. In a paper bag. On fire. **lighting fire with maniacal laugh… Whahahahaaaaa! I’m proud you wrote this. You know my history with the same thing, and I know how hard it is to think about such things, let alone talk about them. I *also* want to cause pain and havoc toward the people that did this to you, even if they are adults now, living what is (hopefully, undoubtedly) a miserable, small life. Look at adorable happy Andreas up there. How could anyone have bullied him? That makes me stabby. You’re my kind of weird, Andreas. That’s the best kind of weird to be. Aw, thanks! It’s really nice to know I have your support. And yes, let’s hope their lives are properly miserable. That’d be most satisfying. Thank you! You’re weird too. And that’s a compliment. Aw Andreas. OMG. I think I now understand your Bond-supervillain style personality. Calm. Calculating. Clever. With a little bit of craziness. But you’re right. I was also bullied and was yanked unceremoniously out of a high school as a result of it (a school my mum made me go at the other end of town miles away from my friends, so unsurprising) and certainly colours you in a very influential time of your life. But, these things make you stronger and help you become a better person, friend and parent in the process. Hopefully my friends and family appreciate what I had to go through to become the apparently wonderful person I am today. Bond-supervillain? Really? You sure you’re not just saying that to make me happy? Yes, it colours you and makes you stronger. In a way, I wouldn’t want to be without the experience today. Although try saying that to my teenage self; I’d have traded the experience for peace of mind at the blink of an eye. But I was young and foolish then, and didn’t appreciate the value of experience later in life. Quite. It’s true that we were probably bullied because we were more interesting than the bullies. And now in hindsight I wouldn’t want to be without the experience I’ve gained from having been bullied in school. But it was a dark time, and I still carry plenty of unprocessed rage and hate, which is something I don’t like. Still, our emotional scars is what makes us us. I only wish that I’d known then what I know now. But that’s not how it works, I guess. I want to find a way to dig out that empowered and confident me I know still exists somewhere in there, too! I believe it takes time, so be patient. Also, try to do things that you find a bit scary and intimidating. That should accelerate the process. Best of luck! I get this completely, although my experience was just the opposite. People I met at school, other students, teachers, etc, thought I was smart and funny and pretty cool. My mother, and following her lead, my three brothers, however, told me daily that I was ugly and creepy and “not nearly as smart as you think you are” (I didn’t, I never understood what the hell people were talking about when they called me smart). When the people who are supposed to love you the most and be your champions aren’t, you grow up highly skeptical of anyone who expresses a different opinion of you. That’s horrible! Your family is supposed to support you and build your confidence – not tear it down! This makes me very sad. I’m glad, however, that you got some positive feedback elsewhere, so that you didn’t grow up feeling all worthless. Because none of us are. And people who try to convince us otherwise are just small and petty and probably scared of the sheer life force within us. You guys and gals are ALL weird. Please take that in the awesome spirit in which it is intended.